What is your position on the Border Adjustment tax? What is your intention to support the First Amendment Defense Act? What is your stance on investigating Russia’s interference in the 2016 election? 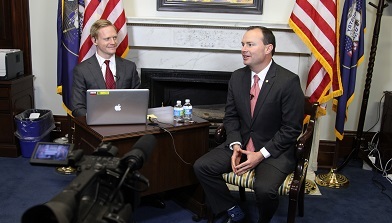 This live, interactive Vekeo video event was hosted by Senator Mike Lee. He discussed the Affordable Care Act; he is not in favor of the current house bill to repeal portions of and replace the ACA. Senator Lee shared that there needs to be more competition in healthcare overall, and that pharmaceutical companies must lower their costs and increase choices for Americans. He also spoke about the need for bipartisan support and finding agreement on both sides of this issue. Senator Lee mentioned that he has worked on several bipartisan bills that have been passed during the previous administration.